As promised, I wrestled this recipe from my God-daughter's mom, and made it tonight. It's still cooling, so I haven't dug in yet, but boy does it smell good! Combine oats, peanuts, brown sugar, and melted butter. Press into the bottom of a 9" spring-form pan. Bake at 325° for 10 minutes. 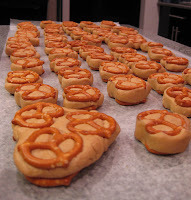 Combine cream cheese, sugar, peanut butter, and flour, mixing at medium speed until blended. Add eggs, one at a time, mixing well after each addition. Blend in milk and banana, pour over crust. Bake at 450° for 10 minutes, reduce oven temperature to 250° and bake an additional 40 minutes. Cool and loosen cake from rim of pan. Chill. Serves 10-12. Tomorrow is the last day for my give-away, so if you haven't already, go ahead and take a guess at the jujubes! I'll announce the winner Sunday night or Monday morning. For a free Kashi meal, go here and enter your information. They'll send you a coupon to try one of their frozen entrees! Alisa at One Frugal Foodie is having a GIANT giveaway here. And, finally, some much delayed Top Chef discussion. I was so, so glad to see Leah go. I thought Leah was this season's Lisa - she just hung around way too long and really needed to go. She had a really crummy attitude and I didn't like that this year's restaurant wars episode ended up being all about her and Hosea's personal cheating drama, rather than focusing more on the restaurants. When they brought those three chefs back, I was pissed Leah had a second chance. I was really gunning for either Jeff or Jaime at that point, because I didn't want to live through Leah again. I thought Jeff did a good job, but in the end I was glad that he was booted off again - I wouldn't have felt like it was a fair fight if he made it all the way to the end, or won, after having been eliminated. He was eliminated for a reason - he shouldn't get a chance to win it! The last episode, I absolutely LOVED that they brought back Marcel (love him! ), Richard, and Casey. I adore Marcel, both Johnny and I really love Richard, and Johnny had a huge crush on Casey during her season. Those were three great choices to bring back, since they'd all made it to the end of their seasons and fell short at the very end. I still think Marcel and Richard should have won their seasons, but the past is the past. Now -- I was actually really shocked when Stefan chose Marcel for his partner. When Carla drew the knife and it said 3, I instantly thought "she got Marcel," because I didn't think anybody would want him. Plus, I thought Stefan would choose Casey because she's an attractive woman and that had been his strategy so far this season - cuddle up and flirt with all the girls (straight or not!) I think if Stefan had chosen Casey the outcome would have been very different. Casey took a very front-seat approach to helping out her partner, and Stefan wouldn't have put up with it. Richard and Marcel seemed to just help their partners, so had Marcel been Carla's partner, I think she would have cooked food more of her own style, versus the suggestions Casey gave. In the end, I was heartbroken for Carla. She had been doing really well and I thought she was a sweet, honest person. She does need to learn to stand up for herself in the kitchen, though. She can't let others boss her dishes around, she just learned that the hard way! I think Hosea deserved to win based on his final meal he cooked, because Stefan seemed to just think he had it "in the bag" and almost played it safe. He got overly cocky in the end, and I think that was his downfall. But, based on the entire season's performance, I find it almost shocking Stefan didn't win in the end! You'll notice he's wearing the same blazer he had on during the Top Chef episode! When we were there, my brother said he had worn it to every event that weekend, and a few of his classmates noted that they've seen him at other events and places, wearing the same blazer! We've also heard from others that they've seen him a few times in magazines - again, the same blazer!!! So - the secret is out - John Besh must only have one blazer and he wears it to every.single.event! Invest in a new jacket, buddy, people are starting to notice! We had a rather large amount of the pot roast remaining from Saturday night, so I decided to make a pot pie from the leftovers. My mom used to make pot pies with turkey meat and beef stew leftovers a lot growing up, but I never have, so I thought I'd give it a try. I've only seen my mom make pot pies from Thanksgiving-style leftovers, or beef stew extras. She'd buy the 2-pack of store bought crusts and fill the bottom shell with the meat, gravy and vegetables, or a few spoonfuls of the stew, and flip the second crust over top and crimp the edges together. They also freeze really well, for dinners in the future. So, I approached mine in much the same way, except I made my crust from scratch. My mom's nemesis are made from scratch crusts. She's just never been able to tackle them, while I don't find them that difficult. For the crust, I used my Better Homes and Gardens New Cook Book again. Stir together flour and salt. Cut in shortening until pieces are the size of small peas. Sprinkle 1 Tbsp water over the mixture, incorporating with a fork. Repeat until moistened. Form dough into a ball and divide in half. Roll out half of the dough on a lightly floured surface. Fit into pie dish and roll out top crust with remaining dough. Fill with desired pie filling and cut slits for the escape of steam. Bake as directed for original recipe. Because all of my contents were cooked, I knew it wasn't going to take hours to bake. I put the pie in the oven, at 350° for 20 minutes with foil on top. I wanted the filling to have a chance to warm up a bit before the crust started browning. Then, I took the foil off and baked an additional 20 minutes. It was still fairly light in color, so I upped the temperature to 375° and baked an additional 15 minutes until it had a nice golden, brown crust and bubbly inside. I naturally have a Type B personality and my mom is very Type A. I think that's the trick in making a pie crust from scratch. You kind of just have to resort that it is what it is, and it might not come out perfectly pretty, but it sure will taste good. I cut in my shortening using the whisk attachment for a hand mixter. I find it gives me better control than a fork, which is kind of hard to get down into a bowl, with the angle of the tongs. You always want to cut the shortening and water into the dough using a utensil, not your hands. The heat from your hands will over-work the dough and melt the shortening. The trick to a flaky crust is to keep it cold for as long as possible. That's why they ask you to use cold water. I always fill a glass or bowl with ice cubes and water, drawing the tablespoons from there, so they're nice and cold. I also like to make the dough a little on the side of moist, since you'll be adding extra flour from your hands, the board, and the rolling pin. While rolling out the bottom crust, I put the second half of the dough in the fridge to keep cool, so it's still nice and easy to work with when its turn comes around. I also use the trick of folding the crust in quarters to move it from the board to the pie plate, so it doesn't tear. Here's our beef pot pie, coming out of the oven. See? Not really perfect, but still doesn't look bad, and certainly didn't taste bad! Growing up, we made a lot of fruit pies with my grandmother, or my mom would make the turkey and beef pot pies and freeze for the future. We always would cut the slits in the top crust as the letter of the contents. P for peach, A for apple, T for turkey, etc. So, out of habit, I cut a B in ours, but you can do any fancy design you want. Some of the slits I cut re-fused and baked together in the oven, so there wasn't a lot of steam escaping. The pie turned out a little watery than expected, but still tasted absolutely delicious. Believe it or not, there is less than 1/4 of it left, between just me and Johnny eating it for dinner!!! P.S. Thank you to those of you who have voted (or maybe still want to vote) for Corky and Poe in the Pet of the Year contest. Unfortunately, some users (ie: Duke's and Charlie's owners) didn't get the point that it's supposed to be a fun contest and thought it was an eBay bidding war. They've racked up almost 4,000 fraudulent votes, each, for their dogs, at last check. I've been in contact with the newspaper staff about it, but it seems there's really nothing they can do until the end of the contest when they're going to issue a statement about the cheating and possibly revoke the prize. It's a shame these people had to ruin it for everybody else, but thanks for any votes you've given my pets! I really do appreciate it, but sadly, it looks like we just don't have a fair shot at winning against these cheaters! I made a little hors d'oeuvre platter for Johnny and me to snack on tonight while waiting on the pasta water to boil. Muenster cheese, pepperoni, and crackers. Now, onto dinner! This week's BSI (blogger secret ingredient) contest is hosted by Brandi at Bran Appetit! and she chose spinach, which I was really excited about. It was pretty convenient, since I had a bag of fresh spinach on hand! Unless I'm baking, I usually don't measure ingredients out, I just throw in what feels "right," tasting along the way. I'll try and estimate the measurements below, but feel free to tweak until it tastes good to you - that's what cooking is all about! To start, I melted the butter in a deep-sided skillet and then added the flour, stirring to make a roux. Let this cook for a few minutes over low heat, until it turns beige, so the raw flour taste disappears. Next, pour in the milk and whisk to incorporate, so there are no clumps. While the milk is fresh in the pan, and still cold, I like to whisk in the corn starch, otherwise it clumps in warm and hot liquids. At this point, I turned the heat up to lower medium low, and left it at this level the rest of the cooking time. I like to create my white sauces on a really steady, low temperature. I stirred in the garlic powder and let those flavors develop a few minutes, and then stirred in the cheeses and let them melt. Whisk the sauce gently until everything is creamy and evenly distributed. (At this point, I thought the sauce was a little flat, so I added the salt.) Then, throw in the pre-cooked chicken slices (this is a good way to use up leftovers!) and let them come up to temperature a few minutes in the sauce. Next, right before the pasta is ready to drain, throw the spinach leaves into the sauce. They'll only need a minute or two to wilt in the sauce. By the time you drain your pasta and spoon it on the plates, it should be ready to go! I spooned the pasta on the plates first, and then ladled the sauce over top, making sure to let each plate get even amounts of chicken and spinach. Last, I topped with a little extra freshly grated parmesan cheese. This is a really easy sauce that you can whip up in just a few minutes, in the time it takes the pasta to cook! There are so many possibilities with the cheese combinations and additions to throw in. Because I start with 1% milk it's never rich and heavy like an alfredo, so even gentler flavors, like the spinach, can hold their own paired with it. Voting begins today for Pet of the Year! Vote on your desktop, your laptop, your work computer, your blackberry... etc. Anything that has an internet connection! My votes aren't working again, but others miraculously have 400+ votes the day the contest opened -- so it's a long shot, but PLEASE VOTE on each of the sites, and pass it on to friends, family, and co-workers and tell them to do the same! We thank you tons and tons!!! Updated: You can now view a video of this pork chop dinner being prepared! Tonight's dinner uses one of the buy 1 get 1 free packages of pork chops. I rinsed them, patted them dry and seasoned both sides with a little garlic powder. For the coating, I dredged them in salt and pepper seasoned flour, beaten egg, and panko breadcrumbs (no whey!). Then, I pan-fried them in a little vegetable oil for about two and a half minutes each side because they were only about 3/4" thick. If you were cooking the thick-cut ones, I would go 3-4 minutes on each side. I took them out of the pan and let them rest on paper towel for a couple minutes as the rest of the meal came together. They were really tender and juicy - just how I love pork. The instant it turns dry, nothing can save it for me. To accompany the pork chops I made my mom's rice-a-roni. We ate this all the time growing up, made from scratch and it never occurred to me until I was in my late teens that it was rice-a-roni. Until I moved out, I'd never even had rice-a-roni from a box, only this home-made version. It's simple- I promise! Probably a lot healthier than the boxed version, too. Just break some dried spaghetti noodles into 1 - 2" pieces and brown in a saucepan with just a little butter and olive oil. Next, throw in 1 cup of white rice, 2 cups of water and a bouillon cube (or 2 cups of stock). Bring to a boil, stir, lower the heat, cover, and let simmer for 20 minutes. You could also substitute brown rice, just adjust the cooking time to 30-50 minutes, depending on the brand, package instructions, etc. This re-heats really well in the microwave, so you could make a big batch and have it as sides for two dinners during the week. My mom has frozen it before, thawed it, and reheated it later, too! Just remember to add a small amount of water to prevent the rice from drying out and getting crunchy in the microwave. Finally, I steamed the last of the Superbowl broccoli with some frozen peas. I love vegetables, so I never really require much spice or seasoning. I prefer the untampered flavor of steamed vegetables, as long as they aren't overdone and soggy. I like them on the crunchier side, where the colors are all still bright and vibrant, and the flavors haven't been watered down. An interesting little tidbit for you, that my brother told me: panko, which are Japanese-style breadcrumbs, are actually ELOCTROCUTED (crazy, right?!?) loaves of bread. There are two types of panko, the white (what I used), which uses crustless bread, and tan, which uses the entire loaf. Apparently they send a surge of electricity through the bread and it electrocutes it, exploding it into the crunchy little breadcrumbs, packaged up and sold as panko! If you're having trouble finding panko at your grocery store, try looking in the ethnic food aisle, by the Chinese food. That's where mine was hiding! Speaking of my brother, he's currently back home in North Carolina, visiting my parents with his girlfriend, who is also a CIA graduate chef. My dad was bragging to me earlier that the two of them are making dinner for my parents tonight. Baked chicken, risotto with real, yes real, black truffles (his words), squash, and mushrooms. Lucky ducks. Not only do chefs cook really awesome meals, but they are dish-washing phenoms! I guess they must get a lot of practice, but Michael can have a whole sink of dishes washed and drying before the meal even hits the table. Double lucky ducks. Cuisinart contest! Make a video, less than 10 minutes in length, cooking a "how-to" recipe and just use a Cuisinart product in the process. Then, submit the video and if you win you get to choose five Cuisinart products! There's six different entry periods, ranging all the way until December of 2010! View their website for more submission and contest rules, but what a great prize! Alisa at One Frugal Foodie is giving away two separate boxes of dairy- and nut-free dark and milk chocolates for Valentine's Day! Another pie plate salad tonight, since Johnny's re-heating the stuffed crust pizza he ordered during the Superbowl. I set to work using up leftovers my own way - on a salad! This week's BSI is hosted by Brandi at Bran Appetit and she chose SPINACH! I'm really excited because I absolutely loved Popeye growing up and could not have fallen for the whole spinach ploy harder. I cannot remember ever not liking spinach, even though it always had a bad reputation. Earlier today I was trying and trying to rack my brain to recall a recipe I used to make in high school. I can vividly remember thawing frozen spinach to squeeze out the excess water and mixing it in with a batter of some sorts, but my memory ends there! Very frustrating. I'll have to search through some old notebooks I used to write recipes down in and see if anything looks familiar. Otherwise, I'll get creative with some fresh spinach I have on hand. How cute is this pasta for a special Valentine's Day dinner? Bonus that it's on sale! During the amazing meat department sale my favorite chicken breasts were half off, so I grabbed 5 packages. I love the Perdue thin sliced chicken breasts because a one pound package usually yields six to eight thin breasts, versus the three super chunky ones of a regular breast package. Also, they are usually trimmed very well with none of the tendons and veins that sometimes appear in the regular breasts. Because they're so thin, they cook up super quickly and are also great for smaller portion control and milking two to three meals out of one package. Tonight, I made a quick marinade of Drew's garlic Italian dressing, garlic powder, salt and pepper. I heated my grill pan really hot and cooked the chicken on the stovetop. I like Drew's dressings because they're all natural and whey free, but the Italian one turned out to be a dud on flavor. It's taste is so mild it gets lost on a salad, so I've been using the bottle up as a marinade or in place of olive oil sometimes. While the chicken was cooking away, I put 1 1/4 cup of water in a small saucepan, a splash of Drew's dressing (in place of the recommended olive oil) and the seasoning packet from Near East's Herbed Chicken couscous. I love the tenderness of couscous. It satisfies that pasta craving, but doesn't leave you feeling all weighted down and tired like a big bowl of spaghetti sometimes does. I saw it made on Bizarre Foods with Andrew Zimmern once and it was really cool! This woman had a very large, shallow wooden bowl filled with the ground semolina. She'd sprinkle water over top and roll her hands over the whole thing, forming the tiny pasta balls we know as couscous! She made it look easy, but I definitely think it's a practice-makes-perfect technique! Getting the right amount of water, and the right hand process down. I'm sure if I tried it'd just be big, soggy blobs and other areas still completely dry! While the water and seasonings were coming up to a boil, I chopped about 1/4 cup each of carrots, celery, green pepper and broccoli from the Superbowl party's leftover veggies. I threw these in the boiling water for about a minute, then dumped in the couscous, cut the heat and put the lid on. Five minutes later, we had a delicious plate of tender, juicy grilled chicken and a 4 veggie couscous that hit the spot! Biz is having her beginning of the month giveaway here. Hangrypants is giving away a jar of almond butter here. I had so much fun with my giveaway last month, I've decided to make it a monthly thing, too! In honor of my birthday, it'll be every month on the 23rd, so make a mental note! My mom, who just celebrated her 50th birthday yesterday, has been a piano teacher for over 30 years. Growing up, she hosted dozens and dozens of events, recitals, performances, Victorian teas, fundraisers, and parties in our home. She pulls out all the stops for each of these, and has always done it on a budget. I've watched over the years how a little bit of prep-work on your end can save a lot of money on the grocery shopping end. Before each of these events, my brother and I (sometimes cousins and friends, too!) would each receive a chopping board and a knife and be put to work. Meanwhile, my mom would assemble an amazing antipasto platter that would be featured prominently in the center of the kitchen, on a rolling butcher's block. To put things in perspective: our local grocery store has a 3 pound vegetable platter for $27.99. I've seen meat and cheese platters, pre-packaged for ~$15. By doing the work yourself, you not only cut the cost, but also have the freedom to choose the quality, quantity, and variety of your own ingredients. This is especially important if one of your guests has an allergy. I'm not sure how many pounds of vegetables I cut up, but I know it was a lot more than 3, because I cut up 2 pounds of carrots alone. Also, 1 bunch of celery, 2 green peppers, 2 cucumbers, and my receipt says 1.49 pounds of broccoli. My cost? $9.83! I made my own dip from sour cream and a soup packet, because I was unable to find a container that didn't contain whey. Not only did this end up saving me money, it is healthier and tastes better, in my opinion. The 12 oz. container of dip was on sale for $2.89, but my 16 oz. home made version cost $2.67. Finally, I cut up my own brick of cheese and roll of pepperoni. Add the buy one get one free box of crackers that I also had a $1 off coupon for, and the entire platter totals $7.14. All this washing, peeling, and cutting took me less than an hour and I actually enjoyed it! Maybe it's all those years of practice, but I find it relaxing to sit at the counter and work my way through vegetables, meat, and cheese - turning them into neat platters as the end result. Happy Superbowling, everybody! And heads up to my fellow Chicagoland neighbors: Monday night at 10 p.m. on the Travel Channel is Anthony Bourdain No Reservations: Chicago. 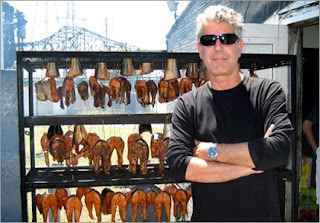 "Anthony Bourdain loves the edge and energy of big cities. So how is it that he has avoided Chicago for so long? In this episode of "No Reservations," Tony sets off to rectify this situation and to finish some unfinished business of his own – to discover new culinary treats, and the secret of the ever-popular deep-dish pizza." Biz, I'm thinking that Easy-as-Pie-Pizza one has your name on it! Personally, the healthy whole grains one is calling to me!